Boston Market is offering coupons good for a $1 chicken meal? Claim: Boston Market is offering coupons good for a $1 chicken meal. Is the coupon real for $1.00 Boston Market chicken dinner? Unlike many other Internet-circulated coupons, however, this one is neither a forgery nor an unauthorized distribution of a print-only coupon. Boston Market is openly offering “$1 Real Chicken Deal” coupons online through its web site (along with other coupons redeemable for discounts on various meal purchases). 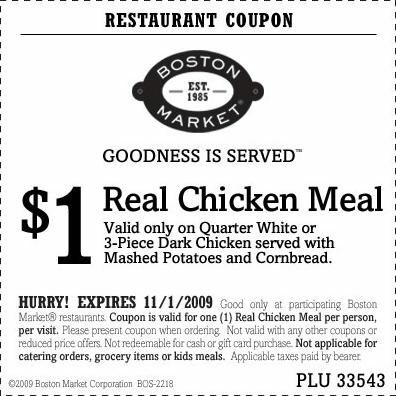 The “$1 Real Chicken Deal” Boston Market coupons are good through 1 November 2009 (and are limited to one meal per person, per visit).